3... 2... 1... Liftoff! Set your foot on Mars, where fantastic adventures await you. 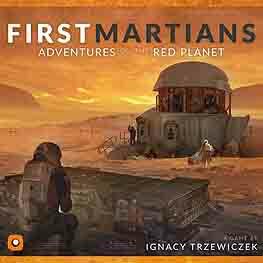 First Martians: Adventure on the Red Planet tells a magnificent history of humans struggling to survive on a hostile frontier. A series of missions form 2 separate campaigns. Make meaningful decisions and face their consequences! Experience thrills and awe as the plot unfolds! Additionally, the box features 6 standalone missions. Choose your preferred difficulty level and mode of play: who do you want to be today? A scientist, an explorer, or an engineer? The game provides massive amounts of replayability, while at the same time the story will always reflect your decisions. This is possible thanks to the accompanying free app which enhances the player experience. It includes over 500 events and adventure, and the AI always chooses them to form a coherent story, adjust the gameplay to your expectations, and immerse you in the narrative. Overarching story leading to a grand finale. Carry your decisions from one mission to the next.